Well there are no ugly women, just the lazy ones. This old saying is so true. Most of us don’t have perfect flawless skin however we can do something to improve our skin conditions. The basic rule to abide is to be diligent with our daily skincare routine and one of them that helps to boost our skin resistance is mask. 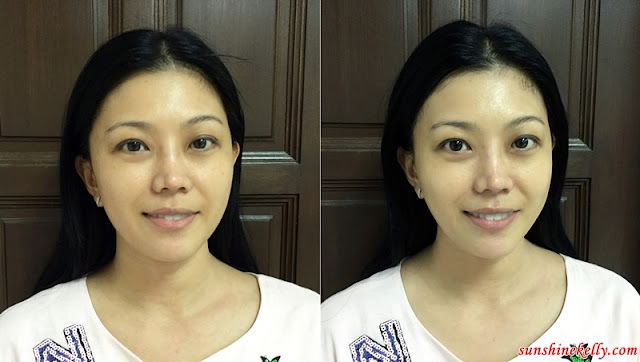 Using the right and effective facial mask does make a lot of difference to my skin. Recently I tried My Secrets of Beauty 7 Days Face Mask Pack, so does it work for my skin? Let me ask you a simple question, how often do you do mask at home? Once, twice, three times a week or everyday or once a month or never??? Try to apply mask at home at least three times a week. Remember, if you want to have a good skin condition you have to be consistent and diligent with your skincare routine. What if I apply face mask everyday for 7 consecutive days? Can you imagine my skin improvements after that? So let's start... here is My Secrets of Beauty 7 Days Face Mask Pack that come in a black box that looks exclusive. I like the sweet soft colors of each mask. The light green is hydrating, light blue for brightening and the pink is for facial firming and anti-aging. These sheet masks are individual packed and easy to use plus is convenient for travelling. Inside the sleek black box there are 3 pieces of Hydrating Masks, 2 pieces of Brightening Mask and 2 pieces of Facial Firming and Anti-Aging Mask. My Secrets of Beauty (MSB) mask is formulated in France and made in Hong Kong. So how should I start? I have dry and dehydrated skin so I started with the hydrating mask, then followed by brightening and on the third day I used the Facial Firming and Anti-Aging Mask. Then, I repeat the cycle again and ended with hydrating mask. I have I completed the 7 days ritual. Hydrating mask is a must for me and this MSB Hydrating Mask is soothing and moisturizing. I can feel that my skin is so supple and plumped after 20 minutes. MSB Hydrating Mask has unique small molecule technology that enables rapid penetration and strong absorption. It helps to repair our skin while nourishing out skin with all the essential skin nutrients plus lock in the moisture so that our skin stay hydrated. 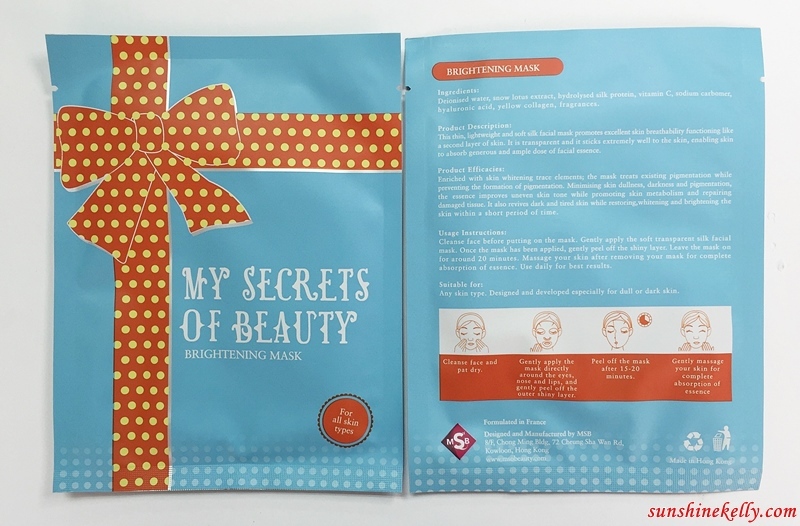 MSB Brightening Mask is Asian women favourite because we love to look fair and radiant, don’t we? This mask is enriched with whitening trace elements that treats the dark spots at the same time prevent the formation of dark spots. It helps to reduce the skin dullness, uneven and yellow skin tone. This mask also helps to refreshed tired skin and brightens the skin complexion. Oh yes I need this mask so that I look fresh the next morning. MSB Facial Firming And Anti-Aging Mask helps to brightens and moisturize my skin at the same time overall improve my skin texture and prevents signs of aging. The firming effect is minimal however the mask helps to deep moisturize my skin thus reduce the dry and fine lines. I feel that my skin look fresh and nourished after using this mask. All the 3 variants of MSB face mask are suitable for all skin types. It has a mild floral scent, it’s very mild and natural. When I put in on my skin feels soothe, cool and relax. The face mask texture is ultra-thin, lightweight and soft silk. It will stick on our face like second skin. The color of the mask is off white towards transparent. Please take note on the correct way to use this mask, don’t use the wrong way and blame the mask is not working for you. MSB face sheet mask has 3 layers as shown in my photo. You have to take off the 2 protective layers, the one in the middle is the mask. Firstly, peel of the first layer in light blue. Then apply the mask it’s the second layer. The soft transparent silk side must be on your face. Then take off the third layer which is the plastic shiny with small holes. Leave it for 20 minutes then take it off. Gently massage the balance essence on the face and neck for complete absorption. The remaining essence on the skin will penetrate and absorb very fast into our skin leaving a soft, smooth and supple skin after every application. As you can see after the MSB Brightening Mask my skin definitely look hydrated, plumped and radiant. The overall yellow skin tone is reduced and skin tone also more even. I love MSB sheet mask as it very convenient to use and carry. The most important things are positive results after using this mask for 7 days consecutively. My skin is hydrated, more radiant and fresh. No more dull, haggard and dehydrated skin. Options: you can use My Secrets of Beauty 7 Days Face Mask Pack continuously for 7 days consecutively or you can also alternate it. For more effective results and for the first time try to use it everyday for 7 days. This is a new brand and perhaps you have not heard about the brand before. Well this mask is not yet available in the market, I am quite privileged to be the first few to try it. My Secrets of Beauty Facial Mask will only be available starting 1st March 2016 on their website, remember to check it out. 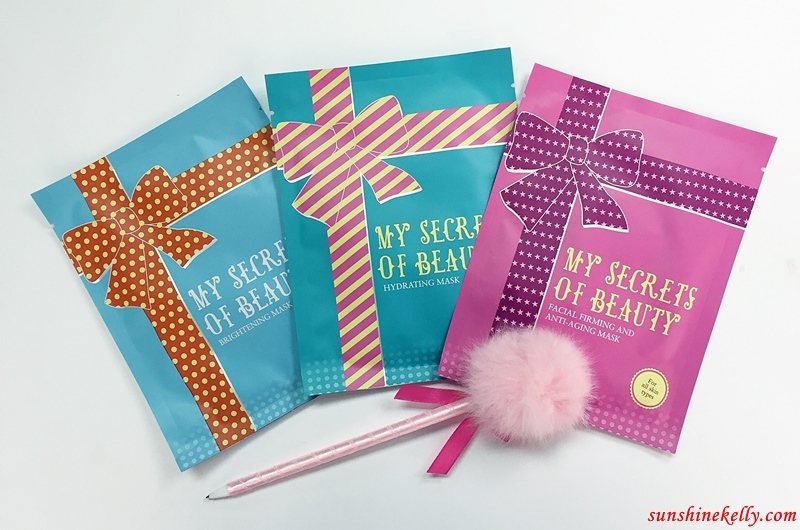 My Secrets of Beauty (MSB) 7 Days Face Mask Pack will be available start on 1st of March and per pack / box consists of 3 pieces of Hydrating Masks, 2 pieces of Brightening Mask and 2 pieces of Facial Firming and Anti-Aging Mask. I love how thin the mask is! Hehe. And its new to find more than a layer of sheet. this silk mask is super thin! I can see the immediate result after using it. not bad! Your skin looks more glowing after using the mask! now im wearing mask but diffwrent brand.. hehehe.. i love mask. should try this brand soon.. The result is good! And motivate me to try this thin mask! MSB Facial Firming And Anti-Aging Mask looks suitable for my skin. I want to looks young again. Will check this out. no try this brand before, looks like easy to use. Wow. Can use 7 days straight? This is great news for everyone. Your skin glows in the after picture, so the product agrees with you. I tried this before...a friend gave me for Christmas pressie. Loved the after feel and waking up the next morning to plump moisturised skin. wow...am impressed with the before and after use of this facial mask :) nice one! Kels I agree with you, sheet masks are fab! Absolutely love this the before and after usage of this - plus the outer packaging is so pretty! I would love to use this mask,your skin looks more glowing after using it, wonderful. I have been using cream by lifecell and the results are amazing.